Which Iconic Sci-Fi Figure Made A Cameo Appearance In Every Episode Of Firefly? What Is The Only Day Of The Week That Derives Its Name From Roman Mythology? 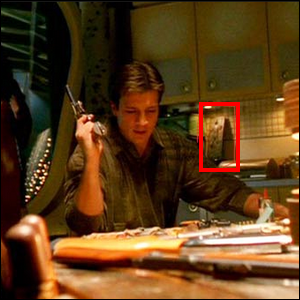 It has been said that in every episode of the critically acclaimed Sci-Fi show Firefly, there is one tiny interloper making a cameo: a scale replica of Star Wars universe anti-hero Han Solo encased in carbonite. The scale figure is from the personal collection of Nathan Fillion, the actor who portrayed Captain Malcolm Reynolds on the show. He brought it to the set and then, among the crew and prop specialists, it became a running joke to quietly sneak it into different scenes.